I love mooching around. London has plenty of places to satisfy that craving. I saw this little lamp in a second-hand shop, and just could not resist taking a photograph of her. I played around a bit and here is the result. I always wonder about items like this, where did she come from, who owned her before, and who let her go and why? 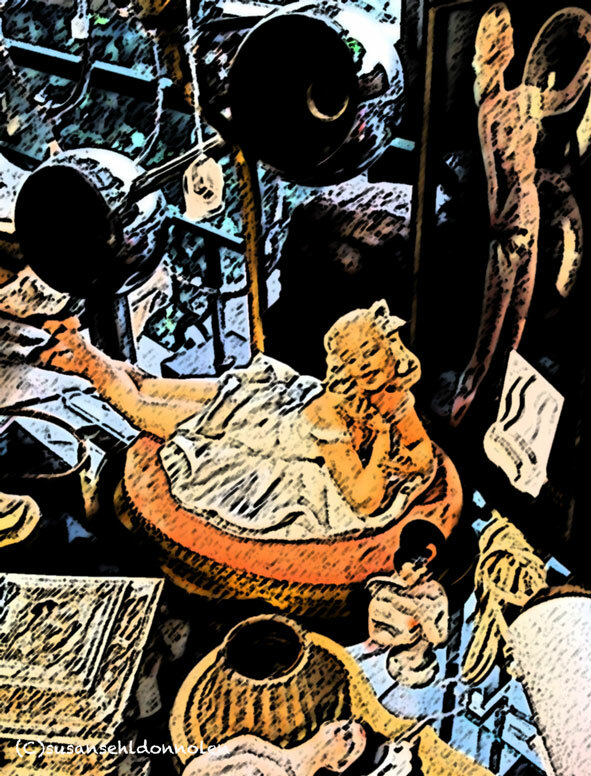 The shop owner had no idea and so she remains a mystery, but mystery or not, I’ve named her– The Little Lamp Girl of London. Gallery | This entry was posted in England and tagged antique shops London, England, Street light, Tales From The City. Bookmark the permalink. Is that a photograph or a painting you did of the photograph? It’s very eye-catching. Thanks! It’s actually an Iphone photo. I did some manipulations and there it is. I like the little girl lamp but don’t think I would buy it. So I hope she’s found a home!